Candidate Engagement, tools that matter! In this hyper competitive market for talent, everyone is looking for ways to stand out to potential candidates. According to the CareerBuilder Talent Supply tool, in some markets there are 16 times more jobs than there are candidates. Take New York-based technical infrastructure positions. There are currently 123,000 open jobs and only 7,000 active candidates. Anyone looking to find ways to differentiate to candidates are realizing that a positive candidate experience is an impactful way to attract, engage, and hire talent. One of the consistent year-over-year findings, is candidates want transparency and feedback in the process. They often refer to the pain point as the “Black Hole”, where they do not receive feedback in the process. Feedback is a key driver of candidate engagement: it keeps them involved in the process, referring friends, and becoming productive employees. Finding ways to reach out to candidates and keep them engaged is critical. The good news is there are tools and technologies that assist & automate the engagement process and enable recruiters to be more effective & efficient. 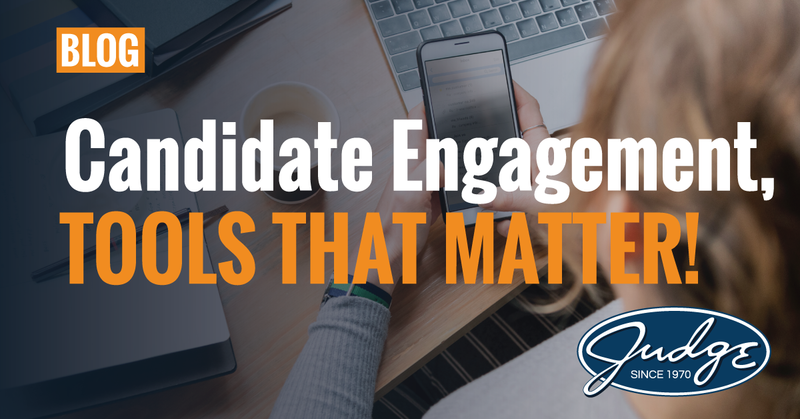 With all of this said, here are 3 Candidate Engagement tools that matter! Easy Apply - This is starting at the beginning of the process, because potential candidates mostly drop out of the process before they even begin. According to SmashFly, “74% of candidates who start the application process drop off before they complete it.” When candidates are presented with jobs, they want the application process to be easy. Stated simply, you cannot engage candidates who have not applied, so make it easy for them! Make sure you have social apply options, and give the candidates the opportunity to be a member of your community. Additionally, as a leader in Talent Acquisition, you should know your company’s drop off rate at the point of job apply. This data point will be eye opening, and give you the ammunition you need to take action and improve the ease at which candidates apply for jobs. Text - The response rate to text versus email is profound. In our research, we see that candidates tend to respond to texts at a higher rate and faster. According to SenseHQ, an engagement and communication platform, the rate of text response is 45%, and within 90 seconds. Emails pale in comparison with 10-15% response rate, and usually 12-18 hours later. There are several text messaging platforms, such as Textus, and TextRecruit, that enable recruiters to send secure 1:1 texts to candidates that can be stored in your applicant tracking system (ATS). By integrating a text solution, we enable our recruiters to send 1:1 personalized texts through the ATS, and to even create future text events. This creates not only a more positive and engaged candidate experience, but also improves the recruiter’s efficiency. For example, a recruiter can set an automated text hours before a scheduled interview as a reminder with driving instructions and links to the manager’s profile. Automated Messages - Having a well-defined recruitment and on-boarding process is the first critical step to a great candidate experience. In our case at The Judge Group, we partnered with a third-party vendor as a means of automating critical candidate and on-boarding steps. The automated messages are from the recruiter and are triggered by events and/or dates. We automated the on-boarding process that welcomes the new employee to The Judge Group and then asks how their first week and month went. Additionally, we regularly send surveys to gauge their satisfaction by way of a Net Promoter Score (NPS). This enables us to understand their rate of referral - a strong indicator of satisfaction. The recruiters use these automated messages as additional touch points to the candidates. When they respond, they jump right into the discussion. There is never a substitute for picking up the phone and contacting a candidate, but automated 1:1 personalized messages is the next best thing. There is a downside to not actively focusing on an engaging and positive candidate experience. The Talent Board reports on their website that only 30% of candidates are very likely to refer other candidates. 35% of candidates are willing to share a negative candidate experience and the more negative the experience, the more they are willing to share with friends via word of mouth and social media. And lastly, 46% of candidates who had a poor overall candidate experience, will take their allegiance, product purchases, and relationships elsewhere. Candidate engagement is a great way to differentiate your company from the competition. Using the tools mentioned above will help you attract the top talent in your industry and retain them for the long term.